Google revealed yesterday that it will shut down Allo, a messaging service that it launched in September 2016 alongside Duo, a video messaging service. Allo users can use the application until March 2019 and export their chat history using instructions posted here. Basically, what users need to do is make sure they run the latest version of Allo on their device. Select Settings > Chat > Export messages from chats or Export stored media from chats, and select where to store them. Messages are exported to a CSV file, media attachments delivered as a zip archive instead. In March 2019, all Allo messages and backups will be deleted. Google has had a bad streak in regards to messaging services. The company tried to enter the market several times in the past decade but failed each time to get enough traction in the market. Hangouts, rumored to be shut down for consumers, will live on according to Google. The Enterprise-only services Hangout Chats and Hangout Meets will be made available to consumers in the future. Duo, the video calling application, lives on as well and won't suffer the same fade as Allo. The app is seeing "strong growth and engagement" according to Google. More than 175 million Android users use Messages already according to Google. 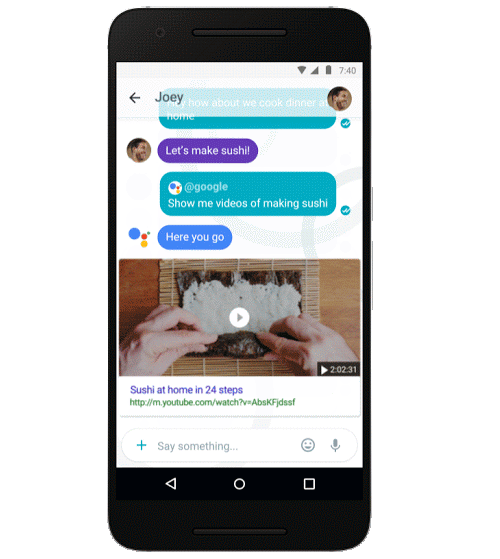 Google introduced features such as Smart Replies or desktop support, of Allo in Messages, and plans to bring the "best of" Allo to Messages. Allo, which faced tough competition from the get-go, was not a terrible application. Some users, including myself, did not really want to invest into another Google communication application that would meet the face of its predecessors eventually, probably. Google was criticized by privacy advocates for storing messages in a way that would allow the company access to them; this opened the door for law enforcement requests who would then gain access to a user's chat history on legal request as well. While Allo did support an Incognito Mode to avoid that, it never stood a chance against messaging applications that encrypted messages so that only chat participants could read them. Now You: Are you an Allo user? Which messaging service do you use primarily? Hangouts, Allo… whatever, users have already chosen which company they want to get all their messages and it’s Facebook. What a joke. Who is going to use a Google messaging app knowing that it will definitely get shutdown shortly?! How many services almost no one knows about does Google have? Google is a data and statistics company but they seriously need to consolidate their teams and projects….KEEP one project open and one beta channel, maybe a canary closed beta test channel. Its that simple, like who even knows how many projects they have going that is closely similar to each other? And did more than 500 people even know about half of them before we read about them on wikipedia 5 years after the project closed down? Only indirectly. Google is primarily an advertising company. Everything else they do is meant to serve their advertising business. Any Google service shut down is good news. If the company itself could shut down it’d be a planetary salvation. Together with Facebook, Twitter and a few other majors of the World Wide Inquisition. I had forgotten that Allo even existed! This is the first time I’ve even seen or heard it mentioned in years. I use Whatsapp, and Chomp for SMS. I did try Messages when there was all the fuss about them incorporating RCS, but since no networks support it yet it seemed a bit pointless, and the app didn’t seem as good as Chomp. Oh, and I sometimes use Facebook Messenger. I tried Hangouts once (when it also supported SMS) but not one of my contacts used it so again it was rather pointless execept as an SMS app (which again wasn’t as good as Chomp). A messaging service of course is used for messaging, so it’s all down to what other people are using at the end of the day.